The performance evaluation and comparison of routing models in telecommunication networks, normally imply the necessity of evaluating them through multidimensional, potentially conflicting, often incommensurate criteria, frequently involving imprecise information regarding the relative importance of the various network performance criteria. As we will show, this is particularly relevant for flow-oriented, decentralized routing optimization methods, having in mind their inherent limitations. Therefore, we formulate a decision problem focused on the comparison and selection of flow-oriented routing models, evaluated through multiple global network performance measures. A proposal of a multi-criteria/multi-attribute approach for tackling this decision problem, based on the VIP (Variable Interdependent Parameter) software, will be described. 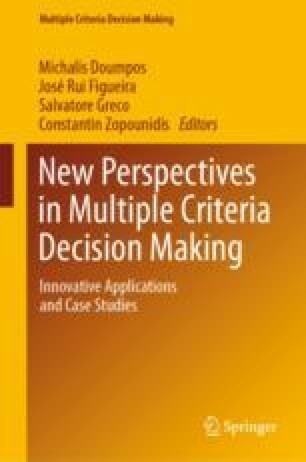 The adequacy of the features of the multi-attribute decision analysis model, which uses additive aggregation of criteria with variable interdependent importance parameters, coping with imprecise information, will be discussed. A detailed formulation of the application of the proposed approach to a specific problem involving the choice of a point-to-point routing method in a modern transport telecom network, from a set of height routing models, by considering their performance evaluated in terms of nine global network performance measures, will be presented. Moreover, the extension of the decision analysis model, based on the VIP decision support tool, for dealing with this problem, in the case of face-to-face cooperative group decision, will be addressed. A case study concerning the application of this approach to the aforementioned decision problem, in a setting involving three decision makers, including a facilitator, will be presented. Finally, some conclusions, both from a methodological and practical nature, founded on the application study, will be put forward, highlighting the interest of this type of approach in this important area of telecom-network design. Note that these coefficients are calculated each time a VC (node to node virtual connection) is established. Note that, in this case, the coefficients don´t have to be calculated for each VC since they depend on the average metric values. The other variants of the routing model seek non-dominated solutions which minimize either the Euclidian or the Chebyschev distance to the ideal optimum, also considering the two different sets of normalizing coefficients WA, WB, determined as explained above. This leads two four variants of the routing model, a3, a4, a5, a6. Further details can be seen in (Martins et al. 2013). Acknowledgement: This work was financially supported by FEDER Funds and National Funds through FCT—‘Fundação para a Ciência e a Tecnologia’ under the projects UID/MULTI/00308/2019 and CENTRO-01-0145-FEDER-029312.